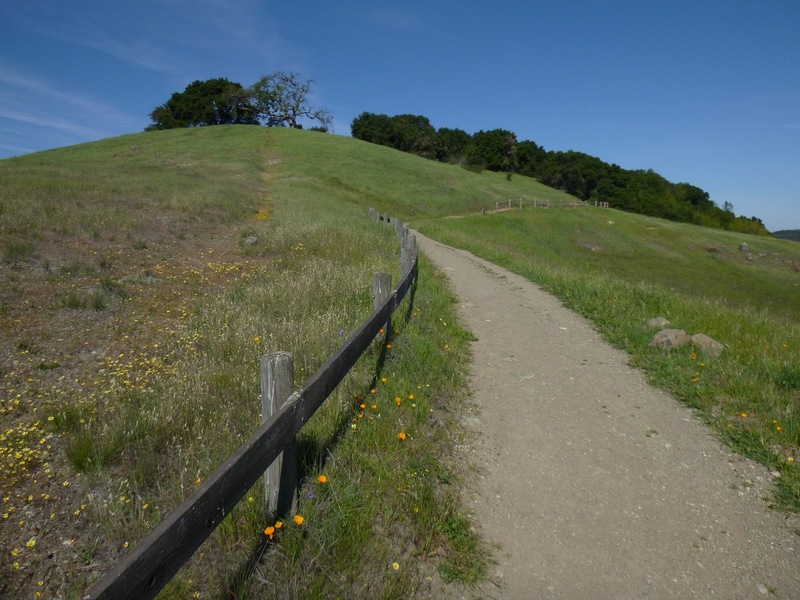 3.1 easy miles featuring wildflowers blooming in woods and grassland near Redwood City. Last week's heat wave toasted some flowers past their peak, but a new bunch of natives are unfolding, including fairy lanterns and golden mariposa lilies. Consider exploring Edgewood on a docent-lead wildflower walk this weekend. I hike at Edgewood throughout the year. Sylvan Loop is mostly shaded and well-graded so even hot days are pleasant. Trails rarely get muddy enough in winter to bother and there's something blooming or fruiting year round. Late April and early May are usually the peak weeks for flowers. Although Edgewood is relatively small, the trail network offers numerous options for loops. Sylvan Loop tours the woodland and Serpentine the grassland. The Edgewood hikes on my website and in the book include woods and grassland, but if you'd rather explore chaparral and grassland, start at the Clarkia trailhead -- it's the express trail to Edgewood's wildflower hotspot. Edgewood is hike number 40 in 60 Hikes in 60 Miles: San Francisco (third edition). Read about this hike on BAHiker (BAHiker hike is different from book version -- both feature good flower displays). Rockville Hills offers a taste of Solano County's undeveloped wilderness. Trails here snake through rolling grassy hills studded with oaks. Serpentine soil fosters many everyday and rare wildflowers, and the display is peaking now.